The 34-percent quota reduction ASMFC approved in February will have a devastating impact on the state’s fishing industry and tourism economy while paradoxically harming the long-term health of the state’s summer flounder stocks, Commissioner Martin said. Recreational and commercial fishing employs 65,000 people and generates some $2.5 billion in annual economic benefits to the state. 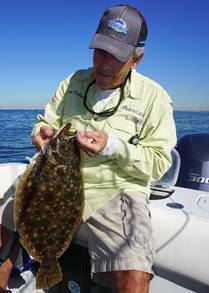 Summer flounder, also known as fluke, is one of the state’s most sought-after recreational fish species, prized for its delicate flavor and easily found close to beaches and in bays and creeks. To achieve the 34-percent reduction, New Jersey faces increasing the minimum size limit for summer flounder from 18 inches in most state waters to 19 inches, making legally sized fish more difficult to keep. Additionally, the number of fish that could be kept under the new restrictions would be reduced from five to three. The petition from New Jersey’s three representatives to ASMFC Chairman Douglas E. Grout cites technical, scientific and procedural flaws as reasons for reconsideration of the vote. The commission was formed by compact to manage nearshore fisheries from Maine to Florida. A DEP analysis of the quota reduction determined that the number of undersized, or discarded, fish that die after being returned to the water will be greater than the number of fish that will be harvested. This would be the first-ever such imbalance for the state. Flounder, like all fish, are susceptible to mortality from hook wounds and stress. “Discard mortality that exceeds harvest is not acceptable from a fishery management standpoint and will not be well received by the recreational fishing sector,” the state’s representatives wrote, adding that such waste would be inconsistent with goals established by federal law. New Jersey representatives to ASMFC are New Jersey Division of Fish and Wildlife Director Larry Herrighty, Governor’s appointee Thomas P. Fote of the Jersey Coast Anglers Association, and Legislative Commissioner Assemblyman Bob Andrejczak (District 1). They noted that summer flounder in New Jersey tend to be smaller than in states to the north due to the species’ biological needs and migration patterns. Moreover, more than 90 percent of summer flounder in New Jersey waters that are greater than 19 inches in length are females, meaning an increase in size limits would encourage higher harvests of reproductive fish, which would also be counterproductive to sound fishery management. In their letter, the representatives argue that ASMFC did not properly consider comments made by the public opposing the reduction during a Jan. 5 hearing in Galloway Township, Atlantic County. They further state that ASFMC staff found numerous mathematical calculation errors after the hearing that resulted in substantive revisions to the draft quota-reduction plan and did not provide the public an opportunity to review the changes and provide additional comments. In addition, ASMFC did not properly apply technical information gathered through the federal Marine Recreational Informational Program, which surveys anglers and members of the fishing industry to provide more complete assessments of the health of fisheries, the representatives wrote. Commissioner Martin testified before ASMFC in opposition to the quota reduction and recently sent a letter to U.S. Commerce Secretary Wilbur Ross requesting that 2016’s quotas remain in effect pending development of a benchmark stock assessment to better understand and manage the resource. Any quota reduction this year would be on top of a 27 percent quota reduction in 2016.